In my book “Beyond Bedside Manner: Preserving the Vessel For Your Soul’s Journey,” one of the key points I touch on is the need for a balance between the Feeling and Thinking Functions in our everyday life. What do I mean by Feeling and Thinking Functions? These two functions refer to what the great psychoanalyst, Dr. Carl Jung, described as part of the four ways we humans perceive and interpret everything in reality: The Feeling Function / The Thinking Function / and / The Intuitive Function / The Sensory Function. They are arranged in a cross shape (Feeling on the Left, its opposite, Thinking, on the right; Intuition on the top and its opposite, Sensation, on the bottom). The psychological role of feeling is to give us value and direction, to evaluate or judge the worth of something or someone. The function of thought is to rationally analyze whatever we encounter, to apply the tools of the intellect independently of any valuation we may have or feel. Both functions (and all four, of course, although we are focusing on feeling and thinking here only) are crucial for us to navigate our way through life. We have, in the West however, tended to place far greater focus upon the Thinking Function and, as such, have repressed or ignored much of our Feeling Lives. This has had serious repercussions and has led to generations of people living their lives with a wound they may not even realize they have. 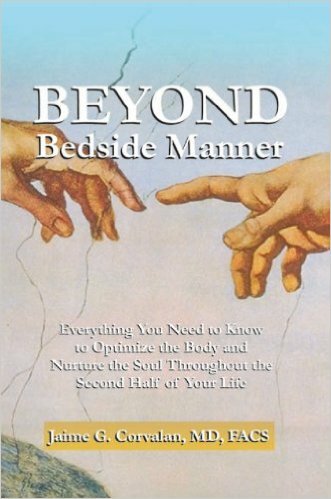 My focus in Beyond Bedside Manner – through the language of optimal health and the medical profession, which is my professional background – is to move to a new perspective in order to participate in the grand evolution of consciousness we are presently undergoing. In order to experience a higher quality of life, we must restore to its rightful place the value and role of the Feeling Function in our daily lives; we must re-balance it with its opposite, the Thinking Function. In doing so, we will cultivate a tremendous respect for all life; we will live the full experience of life. You can conceive of the Thinking Function as a map – it has all of the landmarks and details we need to see where we’re going. What it can’t tell you, however, is which way you want to go. For that, you need a compass – the perfect metaphor for the Feeling Function. So, a balance between the map and the compass, Thinking and Feeling, is key to living the life you were born to live!